It’s Friday afternoon, you’ve made it through the long week, and it’s time for Happy Hour, Gizmodo’s weekly booze, etc. column. A cocktail shaker full of innovation, science, and alcohol. Served on a stick. The brilliance of such a concoction is obvious. The greatest of all the beer cocktails, micheladas require blending juices and spices with beer, so you usually need to add some ice to keep the whole thing cold as you sip. That means you’ll sometimes end up with a drink that’s watery or, worse, warm, tasting more like leftover tomato soup. The popsicle keeps everything the perfect temperature and it also plays upon the paleta, the brightly colored fruit-centric popsicles which are sold on street corners throughout Mexico. Such genius is the invention of the LA restaurant Diablo, an innovative Mexican eatery down the street from me. 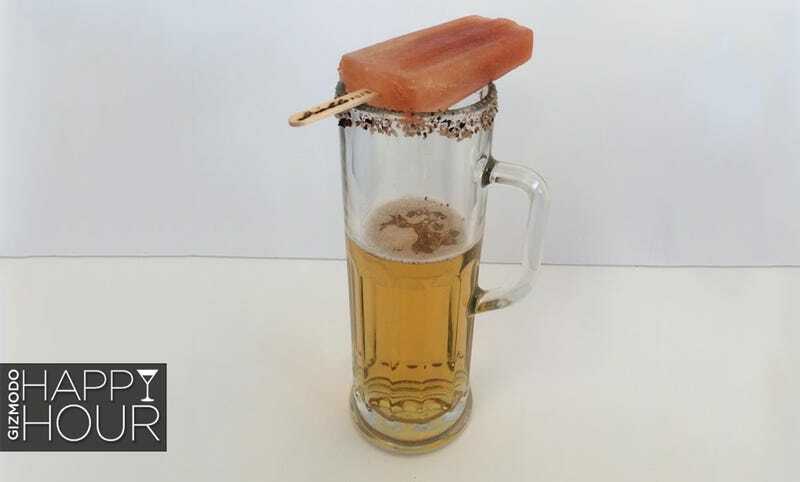 Order a michelada here and you’ll get your pick of different popsicle flavors paired with the beer of your choice. After pioneering the michelada popsicles in-house, they started selling their pops at local grocery stories as well as at Dodger games, and I honestly can’t think of a better beverage to consume while watching Los Angeles baseball. In addition to the traditional tomato lime flavor, Diablo also makes yuzu jalapeño and passion fruit cayenne flavors, as well as plenty of rotating daily specials. The other day I had a banana pop with Belching Beaver’s Peanut Butter Milk Stout that was like eating a cold PB & banana sandwich. I encourage you to experiment with whatever fruits and spices you have on hand and seek out unique beer pairings. Diablo rims their glasses with a chile de árbol and chunky sel gris and recommends you dunk your pop in a Victoria beer or Scrimshaw Pilsner. I’ve taken a few liberties and come up with my own version of Diablo’s tomato-lime pop, but if you’re anywhere near LA, be sure to stop in for the real deal. Preferably before summer is over. Rim large beer glasses with lime, chile de árbol, and kosher salt or sel gris, and serve with the beer of your choice. I like Tecate to keep things simple, but you might find another favorite.